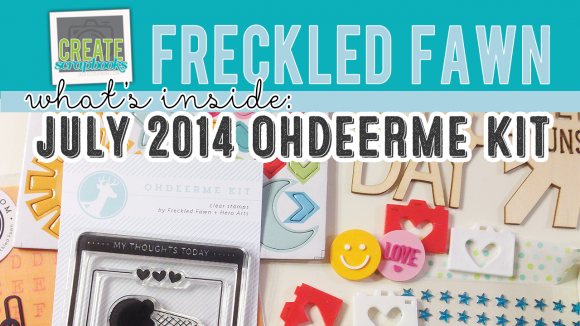 The kit contents for the Freckled Fawn OHDEERME Embellishment Kit Club JULY 2014 kit releases can be found on ScrapClubs.com at this link. 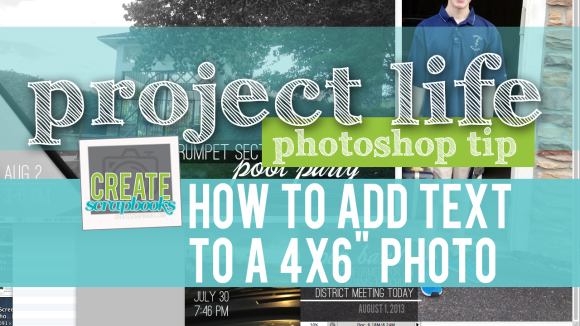 Today I have a new process video where I show you my process of editing an iPhone photo in Photoshop (edit, resize, and add text) for my Project Life scrapbook this week. 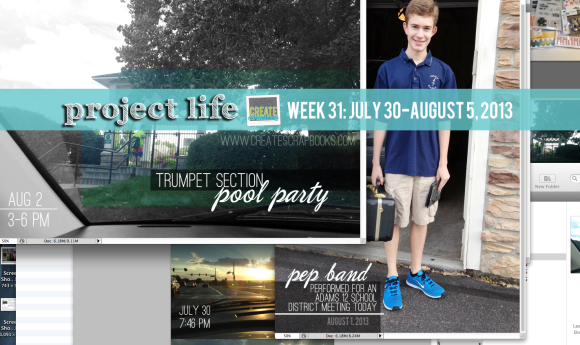 I love to use my iPhone and edit through Photoshop each week for my Project Life layouts. It saves me time, I get the image exactly the way I like, and is convenient for me to do it all myself (including printing). 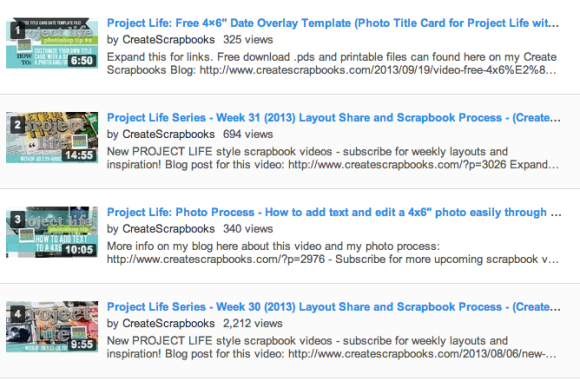 I have started this new weekly Project Life video process series on YouTube to help me keep on track with my own PL scrapbook, share and connect with you, and hope it gives you some great ideas and motivation for your own Project Life and scrapbooking in general. 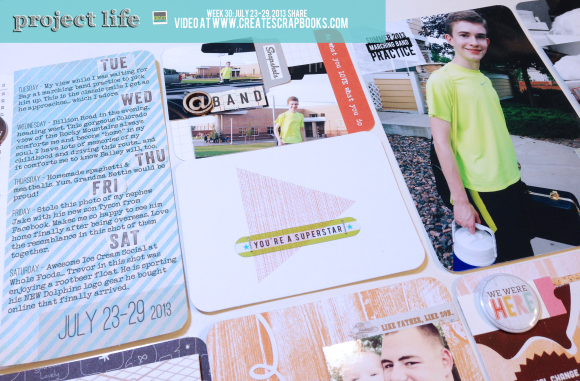 I would love to hear your comments and you can subscribe on my channel to see the latest Create Scrapbooks videos in your subscription feed at YouTube here – http://youtube.com/createscrapbooks. My goal is to share what I am doing, what has been working for me for my scrapbooking, share some files I have created that I feel are useful for my everyday scrapbooking processes. 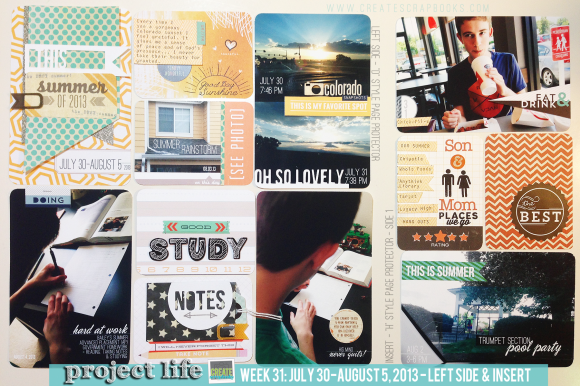 The next video later this week will be the Project Life layout I created for Week 31! 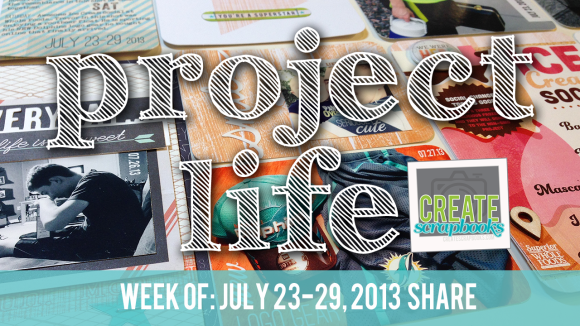 This is Terri Bradford from CreateScrapbooks.com, and wanted to spread the word that I have started my own Project Life scrapbooking video series on YouTube here: http://youtu.be/oL-L1BIFAZQ. 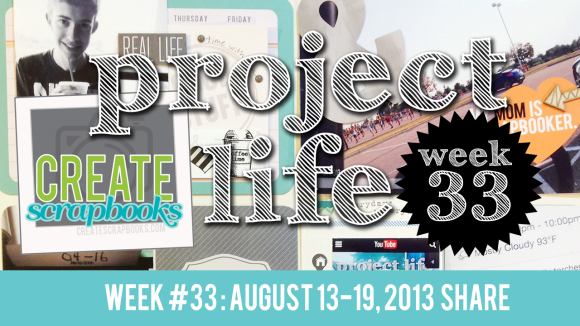 Here’s the first video of the weekly series I created – Project Life – Week 30. I hope you subscribe and comment so we can connect. Yes, YOU! Click on the little red subscribe box, comment under the video (or here on the blog) and tell me what inspires you. First off, a big thank you to everyone who has visited this blog lately… especially YOU! 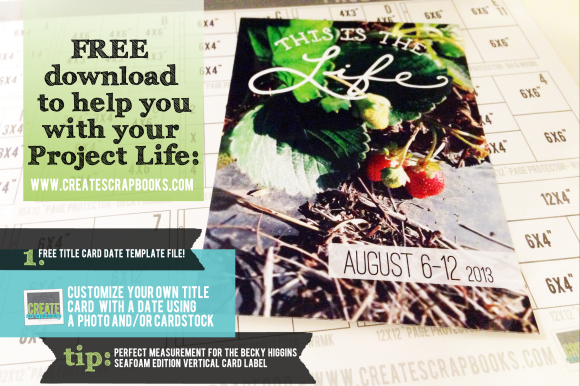 I have been SO inspired by how many people have downloaded the Create Scrapbooks Page Protector Organization free on this blog that I created. It’s been amazing to see the list of where in the world everyone is downloading and using this file I created for myself. I am inspired to do MORE. I am making a difference to someone – I have proof! Woohoo. That has kick-started me and gave me a new spark for moving forward. Hence, this video series that has been on my list of things I wanted to start doing. I have my own set of goals with this series and my own blogging and design journey here at CS. 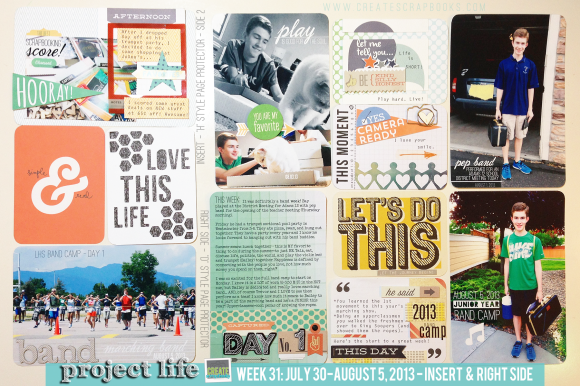 I love so many things about scrapbooking daily life – it always brings me right back to being in a state of gratitude. 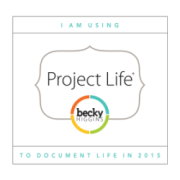 I absolutely love that Project Life has changed and transformed the industry in so many ways. For those of you that have been with me since the “live” scrapbooking shows… stay tuned… new platform is coming soon on that. I am still here and am working hard on it. 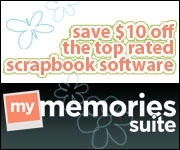 I know what’s trendy, but I really like classic GOOD design… I suppose that is how I scrapbook and live my life. Design is innate in my character and I love what I do. I’ve worked hard behind the scenes and have decided to put myself in the forefront – it’s beyond time for me to believe that what I do impacts someone else on this earth in a positive way. It’s time to see that I have to invest a good chunk of MY time doing what I’ve taught and implemented in clients I have had throughout the years. It’s time. I hope to invest my wealth of passion, knowledge, and love for this industry… join me! There is room for everyone’s ideas, creative input, and we need to support each other in the creative industries. I am here to share my journey, and this is my platform. It’s time. So, plainly, I’ve had this desire to kick to the curb this nagging feeling that I’ve left myself out of my own equation. No excuses, I am worth it… and so are YOU. I hope I inspire you to invest in yourself. 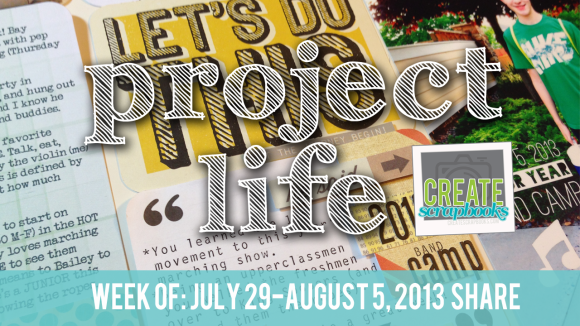 Even if it is just to commit to watching and creating your Project Life spread weekly with me. Let’s motivate each other… connect our positive energies and get some therapy through connecting with others and this love for our scrapbooking hobby. Much love for everyone who has stopped by, downloaded a file or two, sent a message or made a comment, subscribed to my YouTube channel, and trusted me to offer solutions and inspiration. It’s not rocket science, nor am I reinventing the wheel, am perfect, or know everything there is to know about this hobby… but I do want to contribute and make the world a more creative place. I appreciate the support so far and am excited that it’s time… finally! I promise the next post will be about the layout and process. Photos and other design elements: Adobe Photoshop, Over App, iPhone 5, Adobe Photoshop Express App, HP Photosmart A646 printer, HP Advanced Photo paper, and ME! 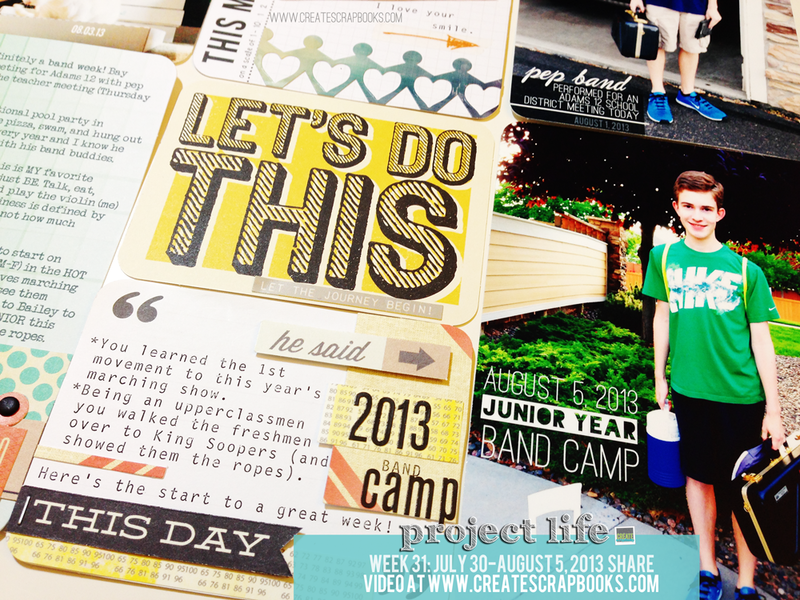 Welcome to the Create Scrapbooks “Get It Organized” Series. I am tackling the art of keeping organized and the use of functional space to make my scrapbooking easier and more enjoyable – and ultimately getting things created and completed easier with less time trying to find what I need. The first topic I decided to focus on is my ever-growing collection of page protectors and pocket pages. I created this simple organization system that has really helped me refocus my energy back to creating instead of trying to figure out which protector I need to use on which layout and keep an inventory on what I have in my stash to use. I have broken down the steps below with photos and step-by-step instructions on this organization project to take you from start to finish below. By focusing on smaller sections of your stash it really IS easy to start and finish a smaller project and you’ll see results fast… I promise. Want to LOVE your supplies, storage solutions, and creative space again? I hope you’ll join me and I will help you get organized during this series! 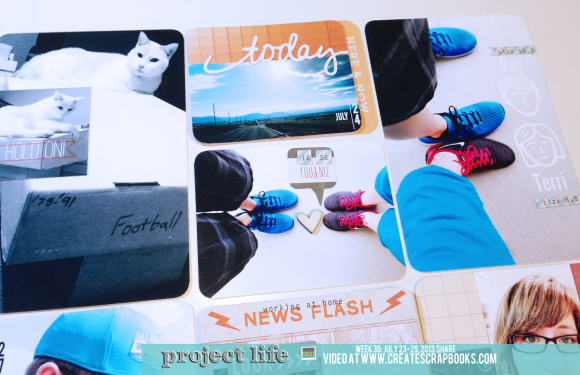 If you have been documenting and incorporating life via a Project Life style album for several years – or are just starting your Project Life journey – you will find you need a good supply of page protectors for your albums and a good way to store and access them while working on your scrapbook. 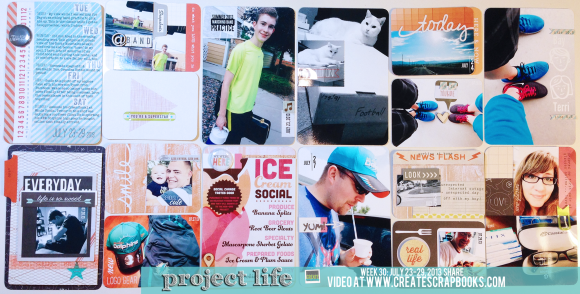 Problem: There are so many sizes, varieties and manufacturers of page protectors available now for Project Life (and scrapbooking in general). 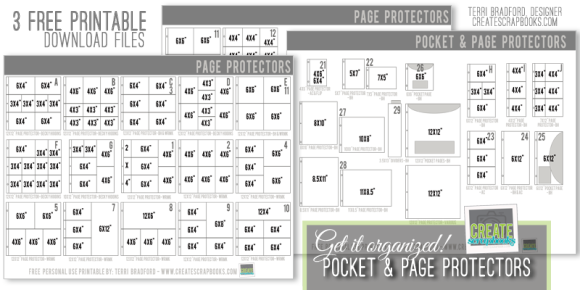 While years back during the initial years of Project Life – via the great Becky Higgins – there were only a few style of page protectors, and now there are so many (and multiple companies selling them), along with variety packs to boot! This is fantastic, however, as you know it just adds MORE variety and a bigger number of options you have at your fingertips. Choices can be exactly what we need, but it can also get you sidetracked if you can’t find what you need or know what you have in your stash. Knowing what styles of page protectors I had on hand and how many I had of each – so I didn’t run out of my favorites (or purchase too many duplicates). Planning for what projects I have started (and will be starting this year that I have planned), and how many of each style I may need in the future. The best way of storing them so that I can have easy access, be able to SEE what I have easily, and the exact sizes of each style so I can print and organize my layouts. 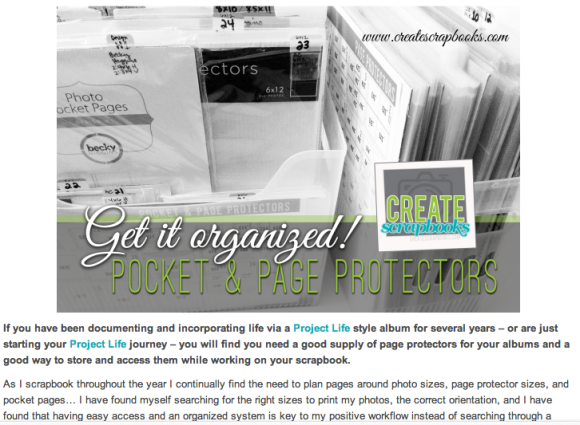 Here’s what I did to get myself organized this week regarding my page protectors. 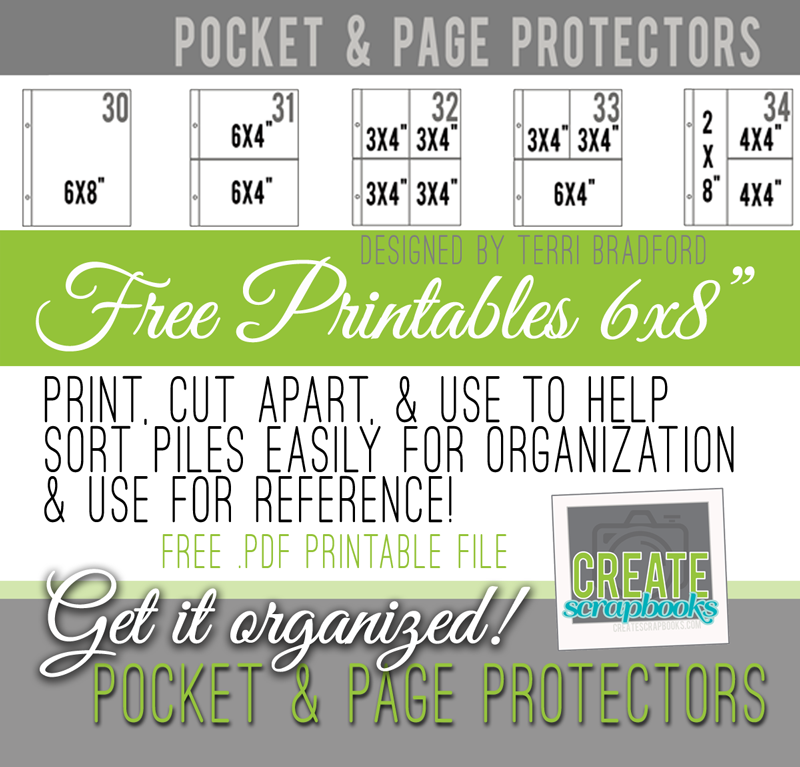 I even designed some free printables (below) for you to give you a creative jumpstart and show you my solution to storage of page protectors. 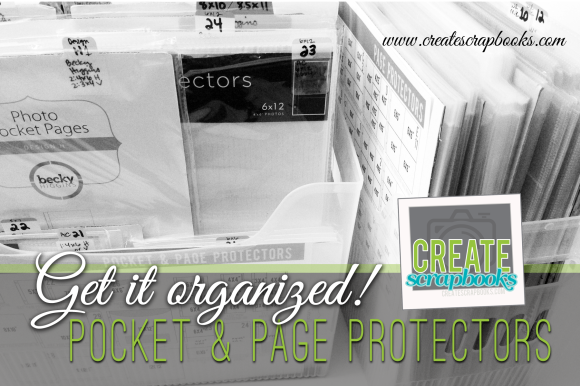 Here’s my step-by-step solution to get your page protectors organized for your Project Life scrapbooking as well as any other projects requiring page protectors. You can break it down even further if needed, but try to tackle it in the next week. You’ll be so proud of yourself – and it will be one less project on your to-do list. To start – you’ll need some room on the floor, table, etc. to work, your stash of pocket and page protectors, a pen (AC Project Life Slick Writers are my favorite!) and some post-it note tabs or paper and scissors. That’s it. Later after reviewing your stash, you’ll need a bin (in my case) or a binder (if you prefer this method). Step 1: Find ALL of your page protectors that you own. Yes, all of them… make sure you check each new/empty album as those can also house a few new protectors that are supplied with the album, and all your stash of crafting/scrapbooking supplies. Tip – If you find you have several different types that are NOT 3-ringed (for example, post-bound scrapbook style) you can put those in a separate pile to organize later if needed. We are going to focus on the 3-ringed style this organizational round. Clear off a large enough space to make several piles – use the floor, table, etc. This won’t be a long project, so the key is to just get started. This is to be able to SEE what you have all in one spot and decide what type of bin or binder you want to store the page protectors in to store them ALL in. I decided on some bins as I have a lot of pocket and page protectors. I’ll go into detail below on this. It’s imperative to really see what you have purchased, collected, and get a good idea of how many of each before you jump into an actual storage solution. Step 2: Print these organization files I created (free!) here and use regular printer paper and cut apart each design (you won’t keep these, so use less ink and print as a draft). Take the stash of all of your 3-ringed page protectors out of their packages – start organizing them by type – one type per pile – and mark each pile with a coordinating image you cut from the printables for visual reference. Note: There are 3 separate files to print (.pdf’s) that are sized to 8.5×11″ to print and have lots of different options to use. For example, “Becky Higgins Design A” pile, “We R Memory Keepers 6-4×6″ vertical” pile, “Becky Higgins Design G” pile, and so on. Tip: When you start going through the packages you’ll notice it is not easy to see the divider markings and styles once you get a stack going since the page protectors are clear, so this for me creating this file and using the images in front of the pile was a nice visual and helped me organize into piles much faster. Important: Keep the original packaging under your piles for each – we’ll repurpose some of the packaging in this project. If for some reason you don’t have a printer or I didn’t include the protector that you have on hand in the printable I created: just do a rough sketch on a piece of paper or use the packaging image that was included with your protectors to help aid you during this process. The point is to get this part done and move on. If you have the envelope-style page protectors decide if you want to keep those in their packages or distribute them out into the piles. Tip: ask yourself how you will try to access these later when you need them – will you remember you have pocket pages and look for those separately or will you want everything together with the protectors? I decided to keep them with the protectors as I will remember to USE them – which is half the battle in organization. Now assess the damage and plan accordingly: What do you have? Do you have a lot of the Becky Higgins Design A and just a few other types? Tip: Jot the numbers on a post-it note, on your phone’s list app, or both to keep inventory. Tip: I put the number on a post-it note on top of the pile at this point for reference later. Step 3: Find a container, box, folder or bin to store or use an old binder – and get ready to create some simple labels. Use what you have on hand first before purchasing something new. I purchased these Mulit-Use Bins from The Container Store a couple years back (they have a big office sale each year and you can get them for just a few bucks each), and they are super handy and fit the protectors (and lots of other scrapbooking papers, etc.) too. I like that I can see through them so I know what the contents hold, yet they are uniform so they fit nicely inside my Ikea Expedit shelving, and they do not take up too much visual weight on the shelves and in the room. I LOVE these. I have way too many to stick in a binder, but if you want to use 3-ringed tabs or binders with tabs you can modify this a bit to suit your needs. 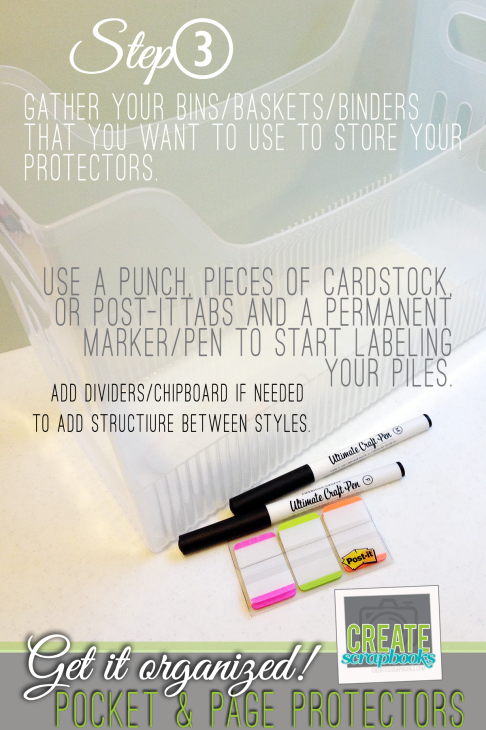 Before you add these piles of protectors into your chosen bin or binder, create coordinating labels to match your inventory to your protectors. If you are storing them in a bin like I am it is important to turn each pile so that the hole seam is at the top so that they fit nicely into the bin and so you can see any manufacturers markings clearly. I recommend labeling the outside for easy access and organization with simple tabs – you can punch some out with your file tab punches with cardstock, hand cut them, or use something else. I personally found the Martha Stewart tabs from Avery (at Staples) and the Post-It Note brand small tabs work great for this and is what I used. I also used my favorite scrapbook pens from American Crafts (Slick Writers in black/Ultimate Craft Pen) and they work great on these slick surface labels shown in the photo. Step 4: Put everything together! 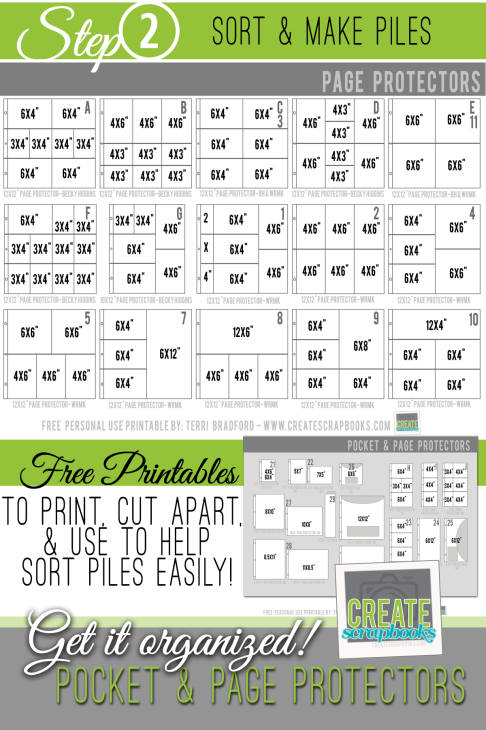 I designed these printable organization sheets to help you in this stage as well. Reprint them if you desire again on nicer heavy weight cardstock (I used 100lb. white that I had on hand) on the best setting for my printer. Set these aside (don’t cut them apart unless you want to) and use them inside the front of your bins or binders (either directly adhere, place in a page protector or whatever you’d like to do in your system that will work for you). Why do this? These are VISUALS to help you remember which pile is where and what sizes for photos, journaling cards, paper, etc. that you have in each binder/bin. I actually printed a set to display in the front of each of my 2 bins filled with protectors (they are clear and I can see conveniently through the front of them to reference sizes). You’ll notice I have labeled (painstakingly as I carefully created the file) what the page protector design is – Becky Higgins “A” – and/or created a number for each one – this is what I wrote on my Post-It Tabs to stick onto a cardboard/chipboard divider or directly onto the page protector and placed the coordinating page protectors behind it. I also printed a second set out to set by my computer so I can REFERENCE sizes to create for photos/journaling cards, etc. in the appropriate page protector. I have found that they are handy in so many ways throughout this organization process for me. Check out how easy this was and how good it looks (if I say so myself) afterwards – makes me excited to USE this system and keep it organized this way! I mentioned for you to save the original packaging to re-use because: I repurposed the original packaging and stored items within the bin that way. For me, I didn’t have a lot of 5×7″, 8×10″, etc. protectors and I liked the stabilization of the Becky Higgins packs with the cardboard inserts they come with – so I used them as dividers within my bin. I did trim off about 1″ on the side to use them individually and just slipped it all back into the clear plastic packaging, attached the tab on the top and cut off the adhesive flap. Works perfect for me! I also used one of the cardboard inserts to adhere my printed page protector sheets I created (pages 1 and 2 together) to the front of one of my larger bins. This secured the front of the larger 12×12 bin and allows me to see everything nicely on the two pages together… and it looks great and is such a help for referencing what’s inside each bin. If you have a different configuration that what I have in my bins and the sheets don’t match your bins you can simply cut the sheets apart, keep the styles you need, and adhere those individually to a sheet of cardstock to customize your own system, and then adhere or place the cardstock in the front of your bin. Make it work for you and custom to how you access your own supplies and make it your own. The larger boxes of protectors (for example, Becky Higgins “Big Packs” of protectors come in a really nice box) serve as such great storage for in-progress pages, projects, storing kits to use, etc. My teenage son has actually used the back of one for a project at school. They are great… keep them if you have space and know you’ll use them. You’ll notice I have several different sizes of protectors and pockets in one bin (see the photo I took that shows the “above” angle). I stuck the odd sizes back into their clear packaging – some with the original cardboard insert and just cut off the tops where the flap and adhesive is so I can reach in and grab what I need but not remove the whole package – and there is not anything to catch your protectors on when you pull them out. Need chipboard to use for dividers? You could use the original packing like I’ve said before, or the backs of your stacks you have laying around, collected from online purchases, cardboard boxes cut to fit, or even ask your local scrapbook store if they have any “extras” that they stash away for free that come with their shipments. If you are still craving some more in-depth how-to on this subject and my method stay tuned and subscribe to the Create Scrapbooks YouTube channel as I will be uploading a new video to compliment this post. In fact, this is a start of a series on scrapbooking organization… so there is so much more to come and I would love for you to get motivated and GET IT ORGANIZED with me! Please use and enjoy the printable files for your personal use… they took too much time to keep them just for myself and to not share! That’s it! Simple, yet so very effective. You can get this done in a day, or a weekend project. Honestly I am SO happy to have this task all done and it looks so very nice in my studio space. Don’t you just love the function of the finished bin and the ease of seeing what you have?